Goose Island is by far one of my favourite breweries, and this mere six pack was all I was able to bring back from my recent trip to the States. Five friends and I drove down to Tennessee, and on the way back, we stopped at a gas station that had this: Goose Island's Honker's Ale. A burst of joy grew within me, knowing that the 16h trip back was not for naught. This has to be one of my favourite types of beer. A caramel, creamy-but-crisp amber... It's what I would think Big Wheel's big brother would be like. ...It truly is the colour of a golden sunset. This post, with a Chicago connection (Goose Island is a Chicago based brewery for those wondering), is all but too fitting for my first post back from my concussion & travel hiatus. Thank you Goose Island. Thank you for being available in that gas station we ended up at after taking a wrong turn near Memphis. 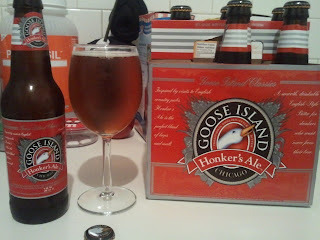 Thank you for creating Honker's Ale - the 30 IBU beer that combines the perfect malts into a desirably rich, golden, prize.